The Garden Condo by FantasyCraft is on ebay. 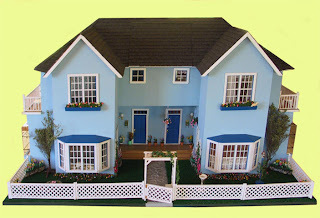 This is a 52"x34"x30 contemporary dollhouse with dual two-bedroom, one bath condo units and a landscaped yard. The finished structure is a prototype that never was produced in kit form. According to the auction description, the dollhouse has been appraised at $10,000. The starting bid is $1,999 and shipping is $1,200.